we've covered a lot of information in this series. i am sure that there will be more to come, but in this installment, we are going to think outside the box and look at an idea that will make your communications more human. this will help to customize the nurture experience even more for your readers while giving your sales team additional marketing material. think about this, you met with your stakeholders, and the mind-maps and brainstorming you did were all over the place - you're full of new ideas, some that can be done, some that can't...but "can't ideas" don't have to be "won't ideas". you just need think creatively when it comes to these ideas. say what now? you spent all those hours developing content to be presented in a certain flow. you optimized the time of day and when to send your emails and now you want me to allow prospects to speed up the nurture emails on their own? how? it's easy...include a flow chart in your communications about what's coming next. with marketing automation, a prospect could click on that topic, speeding up the flow and allowing them get more information right then and there when they want it. if they have taken the time to submit a rfi, opened this email and read it, they might be itching to convert. casual lookers probably won't take the action, but those who want to buy right now might do that instead of waiting for a call from your reps. just be sure when you construct your campaign in your esp that you take into account this acceleration, so that they don't get duplicate emails. when you met with your stakeholders, they told you that prospects call them and consistently ask about topics not covered in your nurture series, which actually may not be a bad thing. your reps do need something to talk about when they have the prospect on the phone, right? we all know that sales reps are focused on closing the deal... so you could implement a standard solution - modifying your nurture series to include those additional topics, which could work or backfire and just change the top questions asked...or you can think outside the box. what if you made your nurture series even more self service? this where my idea for a shotgun solution could help. what do i mean by a shotgun approach? 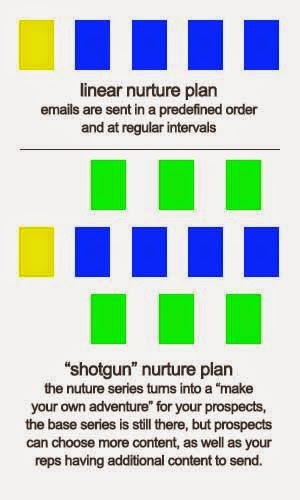 for most of us, we have a welcome series that looks like this: email 1 ----> wait x days ----> email 2 ----> wait x days and so on....pretty linear, focused like a laser beam...but what if you made your nurture series more like a shot gun blast: a single bullet, that breaks up and hits multiple parts of the target. why not try that with your nurture series? here's what I mean and how marketing automation can help you accomplish that goal: this goes without saying but with any kind of testing, keep your current series in place - don't sacrifice what appears to be working. develop supplemental email communications that address the needs stated by your stakeholders and prospects. you can then include something as simple as a "word cloud" in your standard nurture series that when a prospect clicks on the word they get additional emails. in your esp, build into your marketing automation campaign lists that will populate when someone clicks on those links and trigger the send. while the separate list maybe some more work, it also helps you too. the list provides data, you can gauge how popular this topic is, not just relying on a rep's feedback - do they really track how often they are asked those questions? this provides concrete evidence about how popular that topic is, and you might need to consider swapping that content for one of the base emails in your nurture series. individual email length will be shorter. by focusing on your key points and a singular cta, you make the email more digestible. as more and more people use their mobile devices exclusively, the available message real estate shrinks, as does attention spans of readers, while the number if distractions increase. just a few years ago we all used a simple formula for email - tell the prospect the what, illustrate the why, and then tell them how. today's mobile reader only wants the "what" and the "how"...the why is now fluff. cleaner campaigns that are more focused on the conversion goal. human first communication approach promoting two way communication, or the illusion of it. when it comes down to it, we're all lab rats on the internet, we have been conditioned to "click/reward" interactions. there is no reason not carry this forward in email communications - using this methodology is simply giving the prospect what they want...and what does that equal customer engagement. your sales reps now have additional marketing materials that you know keep your brand. if the prospect doesn't use the "self-service library" you created and calls in with a question about a covered topic your sales rep can send it directly for your crm, resulting in a better experience and a record of that topic being covered. now i'm not saying this is the best or even a new way to market to your prospects, but it does make you wonder and with some testing, it could be a valid method to not only make your prospects happy, but also keep your reps from being "wild-west salesmen". you can use this for any number of topics that you might have excluded from the series because of size concerns - testimonials, case studies, or additional products that integrate with the original product request - you're only limited by your product knowledge and the abilities of your esp.